Here are the oh so delicious chicken gyros from our Greek themed dinner with friends. They were surprisingly easy and the Tzatziki sauce is to die for! It’s a Betty Crocker recipe. 1 Spray slow cooker with cooking spray. Add all chicken ingredients to slow cooker and stir. Cover and cook on low 6 – 8 hours or on high 4 – 6 hours. 2 Make Tzatziki, pour any liquid off surface of yogurt. Stir together all Tzatziki ingredients except oil then drizzle oil over top. Cover and refrigerate at least 30 minutes to allow flavors to meld. 3 Remove chicken from slow cooker and shred with 2 forks or in your mixer with the paddle attachment. 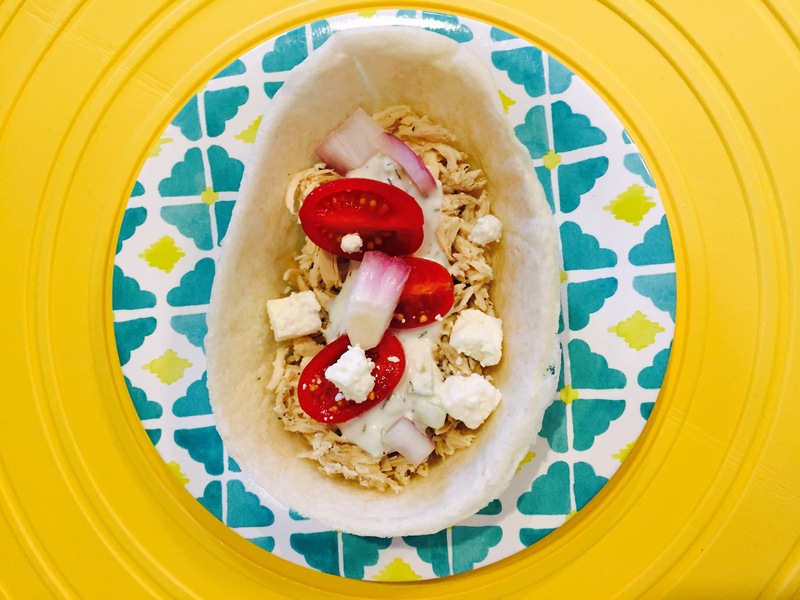 Divide chicken among tortilla bowls and top with Tzatziki, onion, tomatoes and Feta. I loved having everyone together, it was just like old times. Maybe one day we can do it again.